Despite a persistent cold, reigning EWS champ Sam Hill managed to grab the top spot in the final stage of EWS’s tough second round for Team CRC Mavic, securing an admirable 11th place finish. Last year’s Under 21 champ Elliott Heap saw his run of bad luck continue, with snapped chain robbing him of a better position in the Elite division in Tasmania, while Kelan Grant continues to improve, finishing 28th overall. Team manager Nigel Page stormed to fourth place in the Masters division, and sent us this report. For Round 2 of the Enduro World Series, racing went back to the amazing little town of Derby, Tasmania. The small, former tin-mining town has been transformed for mountain biking, with heavy investment in the area ensuring it is 100% set-up to be one of the best venues for the sport in the world. If you like mountain-biking, then put this place on your bucket list and hit up the guys @vertigomtb for shuttles, the best cafe food, and good times. A huge thanks to Buck and his wife for all their help. We raced here two years ago in the pouring rain and the trails were amazing. This time it was dry, and the course included some of the classic trails we rode last time along with a few amazing new trails. Stage 1 was the longest of all the stages, and racing began on Saturday. It had a huge variety of terrain, including massive rock features, flat out DH sections, big jumps, bike park sections, and a good amount of pedalling to test a range of skills and fitness. Sam Hill was still suffering from his cold from the previous week but was riding relatively well despite feeling low on power. He managed a solid 11th place, finishing just 15 seconds back from the top spot on the six-plus minute track. Kelan Grant had another great result grabbing 26th place for the stage. Unfortunately, Elliott Heap’s season isn’t going to plan so far having snapped his chain just three corners into his run. He ended up down in 96th place after losing over a minute making the repairs. Sunday was another big day of racing with another five varied stages featuring some big transitions. Sam Hill managed 8th and 5th place finishes on the early stages, helping him creep up the overall rankings. But crashes on the fast, jumpy, and pedal-packed bike park sections of Stage 4 lost him 13 seconds – I think he would have been close to the win on that stage otherwise. It was then a quick pit stop to check the bikes, grab a sandwich, and climb up to the last two stages. Stage 5 was ‘Sheerpin’, which has a wild rock section at the top. If you and your bike survived that, it was time for a good amount of pedal pumping to carry your speed to the end. Sam finished 11th place on that stage before a big hike and pedal to the final DH stage of the weekend, ‘Trouty’, which was just amazing. Flat out, rocky, and with amazing turns at the bottom, the stage was lined with a packed Tassie crowd who were off the hook, encouraging everyone to give it 100% and more. Sam won this final stage, the shortest and fastest of the race, which was great – finishing on a high and moving up to ninth overall for the race. Good effort buddy. Kelan Grant had another great day of racing and is starting to put it all together, proving what the Irish Pinner is capable of. 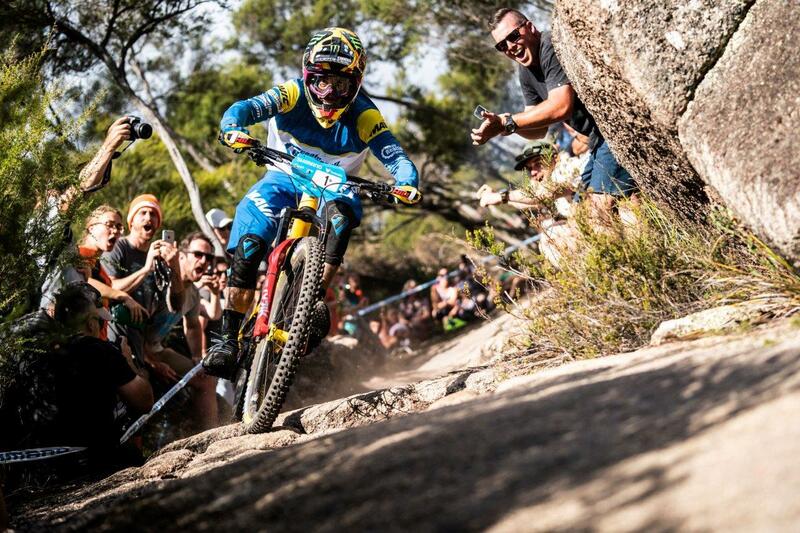 He placed 41st, 19th, 41st, 28th and 16th for a career-best Enduro World Series result of 28th overall for the race. Well done mate. Elliott Heap spun around 180 degrees on a dusty left hander in the first stage of Sunday’s racing and tweaked his bad ankle. He struggled for the rest of the race with not being able to clip out or put much weight on his ankle. Elliott had a few crashes on several stages but pushed as hard as ever. He got back up to 63rd overall for the race but it’s not the place last year’s Under 21 World Champion is capable of. It’s been a tough start for the young lad in the Elite Class but watch this space. He will be up at the pointy end of the results soon enough. I raced the masters category again and cruised through the race the best I could. I managed a 9th, 8th, 9th, 4th, and 7th on the stages and then gave it everything on the last stage to place 2nd, just 0.3 seconds off the win, which I was pleased with. The crowd just made you want to push hard. I ended up 4th overall for the race in the Masters category. A big thanks to Jacy for keeping all the bikes running, all our sponsors, and a huge thanks to the Tassie crowds for the amazing atmosphere. Well done to Ian Harwood from EWS Enduro and his team for an amazing race once again. You fellas killed it. So that’s us done for the first two EWS rounds. We have a month’s break now before the next round when we go back to Madeira.